The Marl Chemical Park is a fully integrated site that is one of the largest of its kind in Europe. Operated as part of the ChemSite Initiative through a partnership between the public and private sectors, this 650 hectare (6.5 km2) site is home to 30 major chemical companies such as Evonik Industries, Sasol, Rohm and Haas, and Vestolit that operate approximately 100 chemical plants here. Pipelines and rail, road, and water transportation links are used to bring in basic feedstocks such as ethylene and propylene, and a newly upgraded Vestolit chlor-alkali facility produces feedstock for the company’s own vinyl production chain as well as chlorine that is supplied to other users at the site. Altogether, more than 4,000 different types of chemicals are produced at the Marl Chemical Park, ranging from high volume materials such as styrene, polystyrene, 1-buten, acrylic acid, ETBE, and PVC to speciality products like polyamides and polyesters, plasticizers, surfactants, elastomers, and latices. Each year, a total of 4 million tons of chemicals produced at the site are shipped to customers all over the world, with approximately 400,000 tons going out by rail, 2.4 million tons by road, 900,000 tons by water, and 300,000 tons by pipeline. 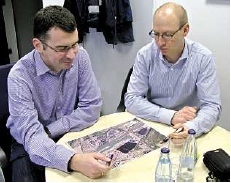 Overseeing all of these operations is Evonik Site Services, the site operator and service provider. The company employs some 3,400 people who tend to the site’s railway, port, pipeline, storage, and other logistics facilities as well as such mission critical infrastructure as power stations, water treatment facilities, and incinerators. The company continues to improve and add to these facilities, and recently completed the construction of a major multi-story warehouse that will serve all of the companies with operations at the site. It is also currently improving the site’s harbor facilities by adding an extra barge berth and upgrading the automation systems that control operations throughout this facility. This has been necessitated by the rising use of automation in the facility’s operations and the increase in volume of information that must be handled. Widespread vertical integration of the control and manufacturing execution systems is another factor resulting in the need for the transfer of more data. Even though the systems at this facility are relatively modern, they already are operating at the limits of their capacity after just a few years of use. As part of these improvements to the site’s harbor facilities, Yokogawa Germany has upgraded the existing CENTUM CS3000 system to CENTUM VP and replaced the legacy safety instrumented system (SIS) with ProSafe-RS. This SIS is fully integrated with CENTUM VP. In addition, the company has installed the latest version of the Exaquantum plant information management system (PIMS). In the past, the control system for the harbor facilities was arranged in two coupled segments, the components of which were connected by means of a system bus with a capacity of 10 megabit/s (Mbps). Installed back in 1999, the old bus system was no longer adequate to meet the demands arising from technology changes such as the increase in computing power and memory capacity in the field control stations (FCSs) and the safety programmable logic controllers (PLCs). The system had reached the limits of its performance. As part of a comprehensive modernization project, the existing bus architecture was replaced with an Ethernet based, star topology, gigabit fiber optic network with six branches linking all the site’s most important control rooms. All in all, more than 10 km of fiber optic data lines were laid for this purpose. The SIS, which is split between segments I and II, was connected via another gigabit bus to the header segment (segment V) containing all human interface functions. Since there was no change in the allocation of segments for the safety PLCs, only minimal modifications were necessary. Segments III, IV, and VI were each hooked up to the header segment via a 10 Mbps bus and a router, and their routers were connected to either two or three FCSs. With the distribution of data traffic over three separate 10 Mbps buses, capacity was significantly increased. In line with these changes, each of the existing FCSs was given a new, more powerful CPU and the central memory was doubled to 32 MB. In addition to the cost gains from not having to replace the FCSs, this made the modernization work much easier. In addition, well over 90% of the I/O channels could be reused as is in the new system. The final change made to the system was the upgrade of the Exaquantum PIMS hardware and software. To prevent the loss of data, a step-by-step approach was adopted whereby the old and new systems were connected to an OPC server and operated in parallel for an interim period. The modernization of the control system was actually carried out over a 15 day period between mid-September and November 2012. The work was based on a precisely formulated roadmap with detailed checklists for every control cabinet, process station, and network component. The preparation phase was very intensive, because Yokogawa wanted to keep the conversion time as short as possible. Among other things, the whole fiber network was installed and meticulously tested upfront. Most of the new hardware components had already been checked and pre-configured at Yokogawa. Furthermore, their interaction during the conversion and migration was simulated there before the systems were transported to their place of use. This pre-FAT (factory acceptance test) turned out to be rather complicated, but it helped in the detection and correction of technical defects and planning errors at an early stage, and saved a lot of time later on. Seemingly simple engineering measures can sometimes help things run much more smoothly. For example, patch panels for segments I, II, and V were installed on the gigabit bus downstream from the network switches, and were then fully wired up to the FCS and safety PLC DIN rail patch sockets and tested. All that remained to be done during the subsequent conversion was to remove and insert short cable segments in the ports of these sockets - with no tangled cables and no risk of wiring errors that could have resulted in substantial delays to analyze and repair faults. It ultimately took less than an hour to port all of the field control stations in this way. Dr. Arndt Glowacki, manager of the harbor and storage facilities in Marl, sums up: "Everyone who contributed to the project was totally satisfied with the outcome. I had high expectations of Yokogawa - after all, our experience of the company from previous projects was very good. And thanks to the formidable quality of the concept and the preliminary work, I wasn’t disappointed! In particular, that says a lot about the excellent cooperation between all stakeholders." Thomas Bagsik, manager of Technical Services for Evonik Industries’ harbor facilities, set out his top priorities for this project: "Serving our customers by ensuring the availability of our facilities is always my number one goal. That’s why we plan continuously to meet future needs. The modernization of our production and process control system is a key pillar in our efforts to reliably handle the steadily growing volume of information. The solution also has to remain affordable, of course." He continues: "By discussing things and designing and planning together, we know the workflows at our company better than anyone else. We’re also in a position to assess the business risks realistically. We need to communicate this information to our automation partner in a structured way if we want everything to run like clockwork later. In my opinion, the ideal partner for a project of this kind is a system supplier that is thoroughly familiar with the hardware and software and also possesses the necessary engineering expertise. At the same time, it makes a huge difference to the teamwork if people already know each other: they’re no longer afraid to speak their minds and they have no inhibitions about placing their trust in the other team members." Plans are already in the pipeline for the next evolutionary step in the automation of the harbor facilities: a new production management system will automate many of the tank logistics processes to an even greater degree, enabling procedures to be standardized and best practices implemented. The harbor facility managers are hoping this new project will benefit them in the form of increased efficiency. One example of this would be higher transhipment volumes with no extra burden on staff. Once again, Yokogawa has been selected to oversee this work.